Discover how to enjoy your outdoor fireplace during every Maryland season. During the spring and summer, having an outdoor kitchen is such an amazing feature to have at your home. It provides another area at your house for your family and friends to gather around and enjoy each other’s company. However, for half the year your outdoor kitchen may seem unusable to you due to the weather. There is no need to worry since there are always means of home improvement that you can make to your outdoor kitchen to make sure that you can enjoy it all year round. If you already have an outdoor kitchen or are considering getting one, then you should know that it is important to make sure that it is waterproof. If it is not, you will have to do some home improvement on your outdoor kitchen to make it so. This is important because odds are, the items in your outdoor kitchen will get wet from either rain, snow, or even your nearby pool. Making sure that your outdoor kitchen is waterproof and features weather-friendly materials is important for letting your outdoor kitchen survive and be ready to use at any point in the year. 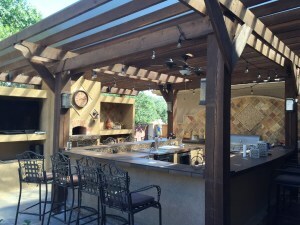 The most important way to make sure your outdoor kitchen is ready to be used year-round is to take up whatever home improvement tasks you need to make sure it has all the amazing features for you and your guests to enjoy and be entertained by. This can include something like a bar for people to have a natural place to gather around and enjoy their drinks. Or perhaps a pizza oven is a home improvement project for your outdoor kitchen for you to serve your guests and family the rare-had treat of homemade pizza. With features like these, you will want to use your outdoor kitchen every day of the year. This entry was posted on Friday, August 3rd, 2018	at 12:39 pm	. You can follow any responses to this entry through the RSS 2.0	feed. Both comments and pings are currently closed.